This is a story of a wedding that has to be shared. A story of the loveliest couple that I have ever worked with…the story of Alexandra and Fuad! It was a clear and warm sunny day on the 3rd of September 2011. The venue,“Les Jardins du Mzaar”, an enchanting garden, situated on 1,850m height, stuck between heaven and earth, overviewing Beirut and Jounyeh bay; This is where Alexandra & Fuad tied their knot and spent an unforgettable soiree with friends and family celebrating their new life together. The charming bride arrived in a black “Panamera” her beauty radiated. She was wearing a glamorous sleeveless, white ball gown dress, small flowers and pearls ornamented the upper part, while an elongated train gave her a majestic appearance. On the sunset, Georges, Alexandra’s dad walked her down the aisle, on the sound of a live orchestra that was playing their favorite symphony “Pachebel”. Purple Aster decorated the aisle giving it a romantic ambiance. While entering the diner area, the beauty of the Orchids and candles that decorated the tables gave the scenery a classy and refined look. There is something about the “Zaffe” that really gets my heart to pump. Fuad’s friends led him to the dance-floor in a spontaneous way. The invitees were cheering and clapping when Alexandra and her four gorgeous bridesmaids showed up on the top of the stairs waving and dancing on a song she really likes. Fuad’s face lit up like a firecracker. They smiled at each other as they walked down the stairs, hand-in-hand, towards the crowd moving on the sound of the amazing music played by the famous DJ Alexis. What can I say more, I spent unforgettable moments preparing the wedding of two amazing people that I became good friends with. Here’s to Alexandra & Fuad! I wish you all the best!!! 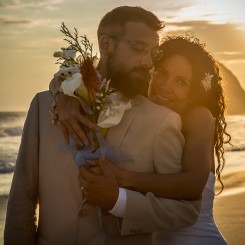 What to write and what to say about our wedding? Do I tell you the story of how Fouad and I met? Do you want to hear about all the details of our wedding? I have a lot to share about the 5 years I’ve been with Fouad, and I have a lot to say about our wedding preparations. Nevertheless, I have decided to tell you about the friendships I’ve developed during the pre-wedding months. Muriel El Asmar, managing partner at Trice Company, accompanied me through every step of the wedding preparation adventure. She was a source of “energy, fun, and love” along with the creativity and expertise which she contributed. We encountered good and bad experiences together. I will never forget her support during all those months. To put it simply: she was a true friend. The florist, the DJ, the caterer, the sound and light manager, the ceremony’s chamber music quartet, and the priests, all blended harmoniously to make of our wedding a beautiful day. We made sure we took the time to know them and develop a special relationship with each of them. We became Alexandra & Fouad, and not only “the couple”, and they became members who added joy to our special day, and not only our suppliers. Our families played a big part. I want to mention my mom who has always been beside me, and Grace, Fouad’s sister, who took care of our wedding invitations which were perfect and so us!! No I haven’t forgotten to mention our photographer: Anna Roussos. Anna came all the way to Lebanon with her husband and her assistant. She added smile to everyone’s face. She was a special guest at our wedding, and added an elegant, fun, and original vibe with just her mere presence among us. Anna’s passion was contagious. Her photos captured the moments of our day, moments that will be kept forever thanks to her amazing talent! Fouad and I have been very lucky to have met genuinely amazing friends, and worked with experts. However, we did not lose sight of the essence of the whole experience: the US in the big picture. We made our wedding look like us (flowers, wedding invites, wish cards, parade, music, cake, cake topper, flowergirl and pageboy costumes), but most importantly, we made sure that our contact with everyone we worked with was a reflection of us. That’s my advice to you! 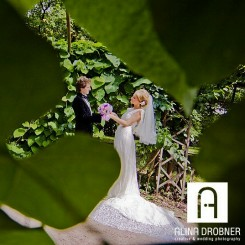 Anna, it was an honor for us to have YOU photograph our day! We made it :)! The photos are absolutely beautiful. Thank you Darren!! We can’t stop looking at our pictures….again and again! Beautiful wedding photography. I’m loving the pictures.